Hal Jordan has faced countless foes, but not even the might of the entire Green Lantern Corps could prevent the Blackest Night. In his hometown of Coast City, Hal Jordan was attacked by Black Lantern Spectre and momentary transformed into a Black Lantern. Saved by a Blue Lantern Guardian, Jordan did the unthinkable to defeat the Spectre - releasing his enemy Parallax and allowing it to possess him! DC Direct made a Black Lantern Hal Jordan figure, but what you had to go through to get them was ridiculous. This figure has a reused body, of course - the one that's used for every other Hal Jordan, naturally - so there are no surprises there. He does have a new right hand, and you can probably guess why: yes, that's right, he's got a newly-sculpted Black Lantern Ring on his finger! Seriously, that never ceases to amaze. Mattel cuts more corners than the Battlestar Galactica prop department, but they keep paying for new tools with nothing but the pattern in a ring being different? Crazy! Hal gets an exciting new head: his hair is tousled, his brow is knit, and his mouth is open in a shout. His skin is still pink, rather than the lifeless gray it should be, so that's a bit of a letdown. All his other costume details are painted on - it's all black and grey, separated by clean white lines. The costume doesn't have any circles on the forearms, which should make Rustin happy. The figure has no accessories, which is good - there is no battery that he'd have to come with, and they don't really use ring constructs (other than Batman and the bats he vomited up). All he comes with is the head and crotch of the Series 17 BAF, the Anti-Monitor. The metallic paint looks pretty nice. 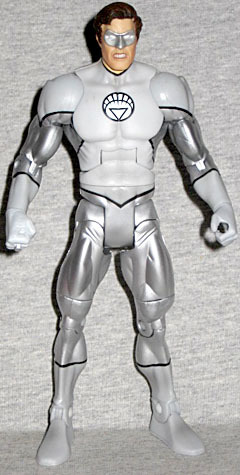 Hal is the figure in Series 17 who gets a variant, this time as a White Lantern. 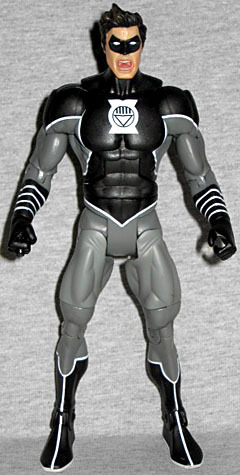 He also gets a new head, still angrier than the previous versions, but not as much as the Black Lantern head. His teeth are showing, so it's more of a growl than a yell. Still a good look for him, and would even work in Green. You know, the look of indomitable will? Oh, and he's also combed his hair. Hal Jordan has faced countless foes, but not even the might of the entire Green Lantern Corps could prevent the Blackest Night. Under siege by Nekron, the White Entity bestowed its power upon Hal Jordan, who used it to free heroes like Superman and Green Arrow from Nekron's control. Together, supercharged by the White Light, they formed a White Lantern Corps and charged headlong into the final battle against Nekron's forces of death. This entry was posted in blog exclusive review, DC, Four Horsemen, Mattel and tagged DCUC, Green Lantern. Bookmark the permalink. The layout on this review was a serious visual treat...almost palindromic (is that a word? Meh, close enough). Do they both come with the BAF pieces?